Afternoon tea is a time-honoured tradition in Britain. It’s difficult to disagree with legendary nineteenth century writer of The Portrait of a Lady Henry James who once proclaimed “there are few hours in life more agreeable than the hour dedicated to the ceremony known as afternoon tea”. The quintessentially English ritual owes its origins to Anna Maria Russell, the 7th Duchess of Bedford and close friend of Queen Victoria. She’s credited with taking a pot of tea and light snack into her boudoir between breakfast and dinner after complaining of ‘having that sinking feeling’ during the late afternoon. Her habit quickly became a fashionable social event. Back in Henry James and the Duchesses’ day, afternoon tea was strictly for the upper and middle classes though and the tradition almost died out completely due to tea rationing after two World Wars and later the rapid growth of coffee bars. However, during the last 10 years there has been a huge resurgence across the country and Manchester is no exception. With the elegant mid afternoon meal first being offered by high-end hotels and more recently by several restaurants and the ever-growing number of tearooms. 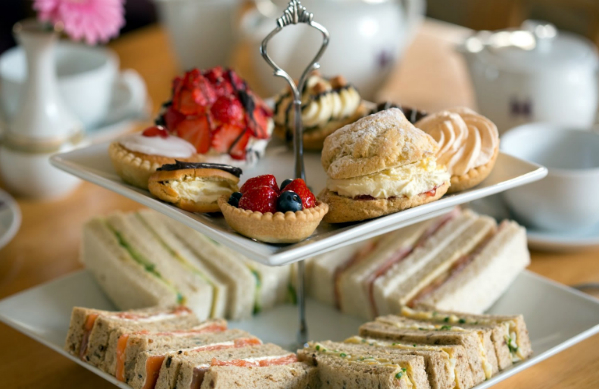 A classic afternoon tea generally consists of finger sandwiches, often including cucumber, egg mayonnaise with cress, smoked salmon with cream cheese or ham and mustard. Followed by scones with jam and clotted cream, a variety of cakes and pastries and of course, tea. You can treat yourself to a classic afternoon tea at many places around the city including some of the best hotels such as the Lowry Hotel, Midland Hotel and Cloud 23 in the Deansgate Hilton hotel. With the latter also providing stunning views from its twenty-third floor location. For an even more luxurious experience, most places also offer an upgrade to ‘Champagne Afternoon Tea’ where you can sip a glass of bubbles whilst indulging in savoury and sweet treats. You don’t need to head to a hotel though; several top restaurants such as Manchester House, Harvey Nichols Second Floor Restaurant, 47 King Street West and Annie’s are also serving afternoon tea. The best value can often be found away from the hotels and restaurants in the slightly less glamorous but equally charming tea rooms of Manchester. In the Northern Quarter at Tea 4, RosyLee Tea Rooms and Teacup. Or at The Vienna Coffee House near St Peter’s Square where afternoon tea costs just £12.95. For something a little more unusual try Afternoon Tea with a twist. Chaophraya’s ‘Thai Afternoon Tea’ offers savoury & sweet Thai bites along with authentic Thai tea. While both Opus One at the Radisson Blu Edwardian and the Victoria and Albert Marriot hotel situated on the banks of the River Irwell offer a ‘Gentlemen’s Afternoon Tea’ containing more masculine dishes such as filled mini Yorkshire puddings, Pork Pies and mini burgers. 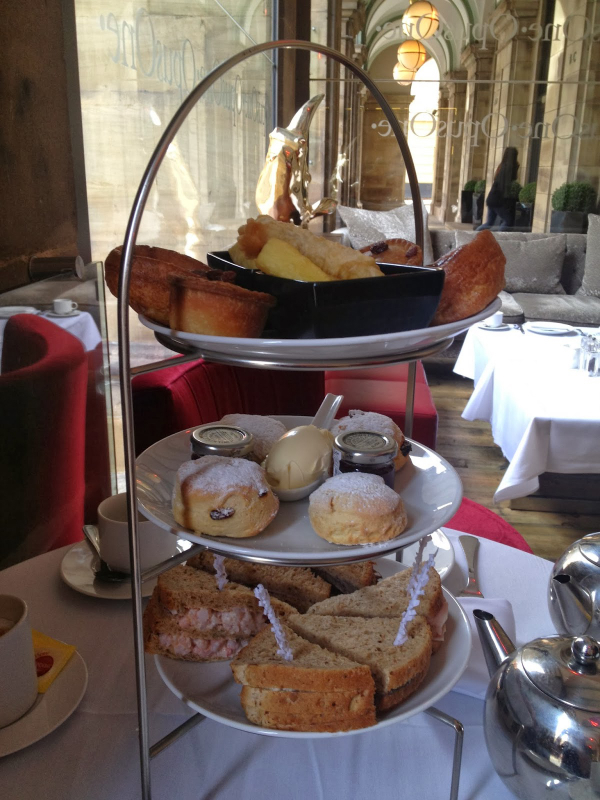 Check out our deals for afternoon tea in Manchester.